Dieters looking for a quick fix may turn to the promise of negative-calorie foods. But can eating actually burn calories? Spring can be a confusing time for the body-conscious - a time when thoughts drift towards summer on the beach, but chilly temperatures have many reaching for an extra biscuit. Those looking to shed a few pounds have often clung to the hope of "negative-calorie" foods - a workout for your taste buds that burns calories while you chew. But do these foods actually exist? "A negative-calorie food would by definition consume more calories, for the body to handle it and process it, than is contained in the nutrient content in the food. "Theoretically that's possible," says Tim Garvey, chair of the department of nutrition sciences at the University of Alabama, Birmingham. "In actuality there are no negative-calorie foods," he says. Or, as the esteemed nutritionist Marion Nestle put it in a one-line email to the BBC: "Total myth. Nothing else to be said." Consider celery, often proposed as a negative-calorie food due to its low-calorie count, high water density, and impressive fibre content. While all that chewing and digesting of the fibrous food does burn calories, it doesn't burn a lot. " There may be just 10 calories in a larger stick, but the body takes only one-fifth that much," to process, says Dr Garvey. "It's still calorie plus." 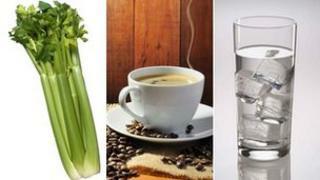 Never mind that man cannot live on celery alone, and few people just eat raw celery. "It's more of a gateway to cream cheese or peanut butter," says David Grotto, a nutritionist and author of The Best Things You Can Eat. That's not to say that celery sticks - along with other high fibre, water-heavy fruits and vegetables - have no value as weight-loss aids. "These foods do fill up the stomach and increase satiety," says Dr Garvey, keeping you from ingesting more calories later - but not burning off the calories you've already consumed. But there are other things you can eat or drink that are supposed to work in a different way, by making the body work harder. One is cold water, which the body has to warm up to 37C (98.6F). But Grotto is not particularly impressed. "There's no research to say that cold water drinkers burn more calories," he says. "Any amount of metabolic hit is not a significant amount - maybe five calories." Other foods have different ways of increasing the rate at which we burn calories (otherwise known as the metabolic rate). Caffeine, guanine, taurine and green tea extracts all have these properties, says Ron Mendel, who has done research on diet drinks that combine these ingredients. In a study with only 20 participants, he found that those who consumed a diet drink called Celsius, which debuted in 2005, burned more calories than when they drank diet cola. "The big picture here is, this is certainly not adding up to hundreds of calories a day by any stretch," says Mendel, the programme director for exercise science at Mount Union University in Alliance, Ohio. "There's no magic bullet," he says. Still, he speculates the small gains could result in a loss of 10lb (4.5kg) over a year. "I wouldn't say it was going to replace me exercising and make up for me from eating 4-5 donuts a day," he says. "But if you just make that one change, over a significant amount of time, it could add up to something." Dr Garvey is sceptical that the change in metabolism could lead to real weight loss. As a doctor focused on obesity and nutrition, Dr Garvey maintains that the only real way to lose weight is the boring, old-fashioned, unsatisfying and ultimately successful method: eat fewer calories than you burn through exercise - not digestion.